Western tarnished plant bug (Lygus hesperus), also known as lygus bug, is a major pest of strawberries in California. Ideal environmental conditions and the diversity and abundance of crop and weed hosts that support the pest contributed to its increasing populations. Twospotted spider mite (Tetranychus urticae), greenhouse whitefly (Trialeurodes vaporariorum), western flower thrips (Frankliniella occidentalis), and some lepidopterans are other major pests in California strawberries. According to the Pesticide Use Report, there was an increase in the use of six pesticides from 2011 to 2012 and four of them were applied for managing the lygus bug in California strawberries (CDPR, 2013). 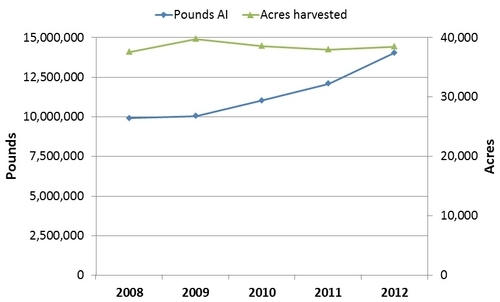 An increase of 15% in abamectin, 62% in acetamiprid, 19% in bifenthrin, and 29% in novaluron was reported during this period while the harvested strawberry acreage increased from 38,000 to 38,500 during this period. The primary target of these four insecticides was lygus bug. There was a 6% decline in fenpropathrin and 11% decline in malathion, which are mainly used for controlling whiteflies. 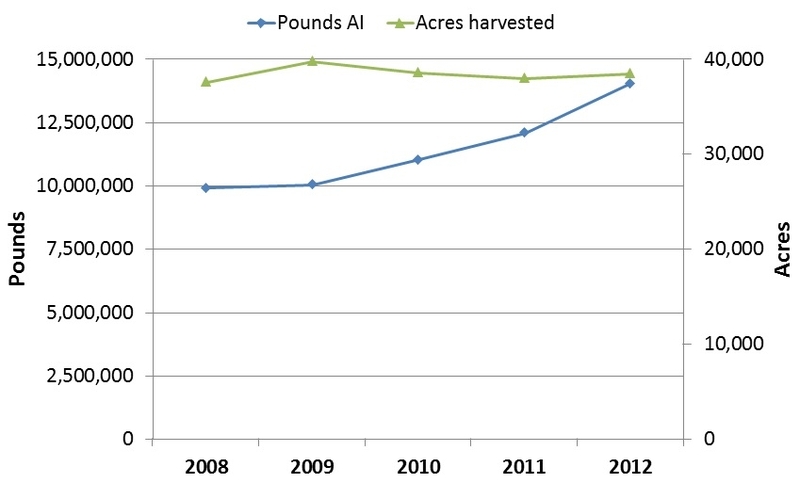 Strawberry acreage and pesticides (pounds of active ingredient) used from 2008 to 2012 in California. About a quarter million pounds of pesticides were applied for arthropod pest management in strawberries in 2012 and about 80% of them were chemical pesticides. 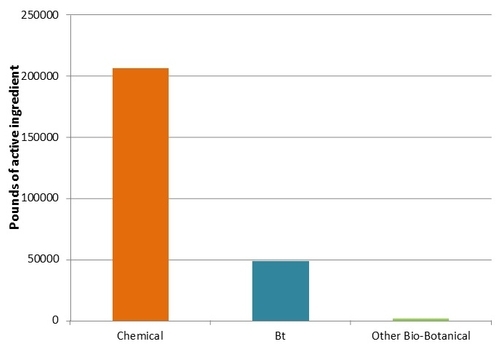 The remaining 20% are biopesticides and botanicals, among which 19% were Bacillus thiringiensis-based pesticides used against lepidopteran pests. That leaves a very small proportion (0.53%) for pytherins, azadirachtin, and entomopathogenic fungus, Beauveria bassiana. There was a 36% reduction in the use of azadirachtin in 2012. My recent studies demonstrated the potential of azadirachtin, B. bassiana, rosemary and cotton seed oil mix, and some bacterial-based insecticides in managing lygus bug, and spider mites on strawberries (Dara 2013, 2014, and unpublished). A balanced approach where chemical pesticides are rotated and combined with other alternatives can improve pest management efficacy and promote environmental safety.